Cirque Du Soleil teams with designers Raymond St-Jean and Jimmy Lakatos for projections for Michael Jackson One. The video design took a large team of talented designers working extremely quickly for Michael Jackson ONE™ at Mandalay Bay in Las Vegas. Longtime collaborators Raymond St-Jean and Jimmy Lakatos led the team, which needed to roll with the punches while creating complicated and riveting imagery. While Lakatos considers his purview to be “video scenography,” St-Jean designs the images and graphic language of the piece. “My skill is more to make sure the integration of the content will be efficient,” Lakatos says. St-Jean and Lakatos brought in collaborators at Fly Studio, including Jean-François Talbot, to generate the actual imagery and content. Lakatos considers working with projection as a more “feminine” approach. “More and more, you need to discuss a lot with the lighting designer so that light doesn’t ‘destroy’ the image,” he says. “David Finn is a marvelous lighting designer who really understands well how to work with us.” The idea, of course, is to maintain both the project image and the mood evoked by the light without having to sacrifice either. In ONE, there is an LED screen that had been purchased for Cirque’s recently closed Viva Elvis, but it is dimmed for much of the show. 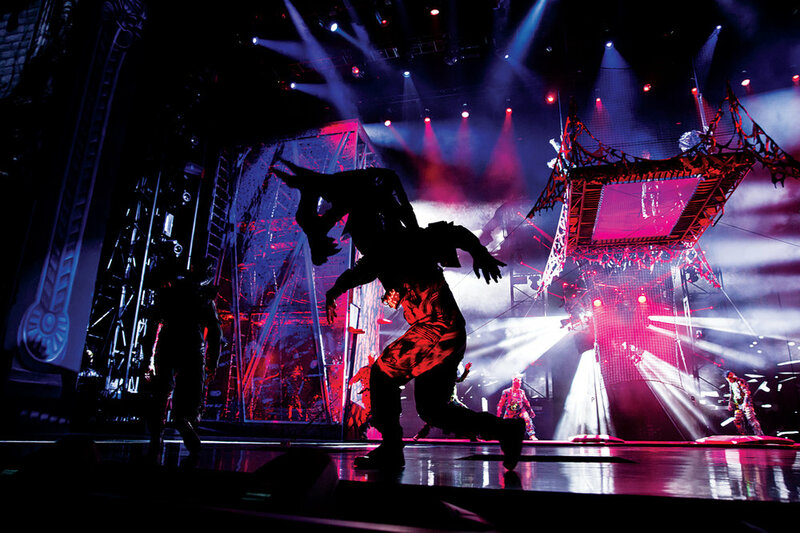 The original design of ONE was meant to “evoke the presence of Michael,” but both the Jackson estate and the creators of Cirque du Soleil really felt that there needed to be a more palpable presence of Michael. From the beginning, the end of the piece was meant to culminate in a Pepper’s ghost effect, which would conjure Jackson dancing with the live performers onstage. But eventually, footage from Jackson’s videos also became part of the video design of ONE. As ideas developed, Lakatos and St-Jean worked with words and images to create the visual language of the piece with King. Then they worked with 2D illustrators and guided them through many images. As St-Jean explains, “Once we get the image that is pretty close to what we want, we take the illustration to the 3D animators to do modeling. We cannot start 3D animation without being sure of what we want to do.” Because the whole show was set to Jackson’s music, the design could be timecoded, which made it easier for the motion-graphic animators. They also collaborated with video designer Dago Gonzalez, and Lemieux and Pilon, who created the Pepper’s ghost effect. Technomedia Solutions provided the gear, with Andrew Atienza as project manager.